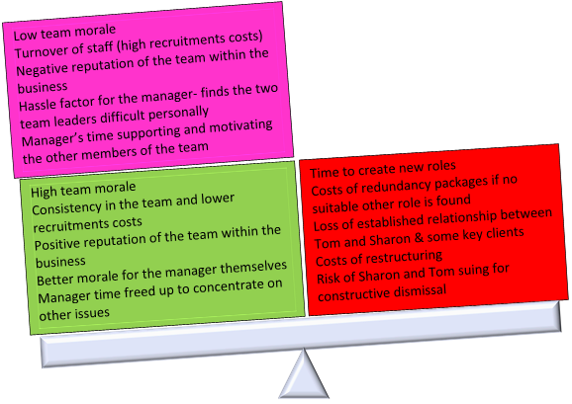 How do you calculate the true cost of an organisational problem? We may struggle to convince others of the value of change. They don’t feel the problem is sufficiently large to warrant the effort of change – particularly if it’s not impacting them personally. The main impact may be on front line staff who are far removed from the managers making the decision. How can we ensure these elements are factored in and raise our client’s awareness of the full scope of the problem? 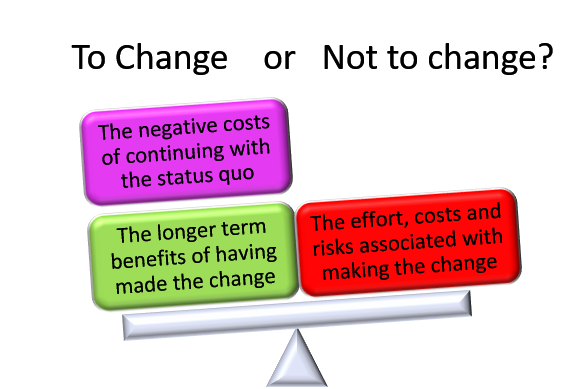 On other occasions, others may be convinced of the need for change, and only afterwards realise that the cost of implementing the organisational change didn’t really justify the additional value it generated. 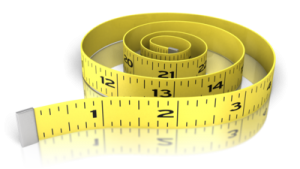 In other words, we need to weigh up the following and see which way the scales tip. 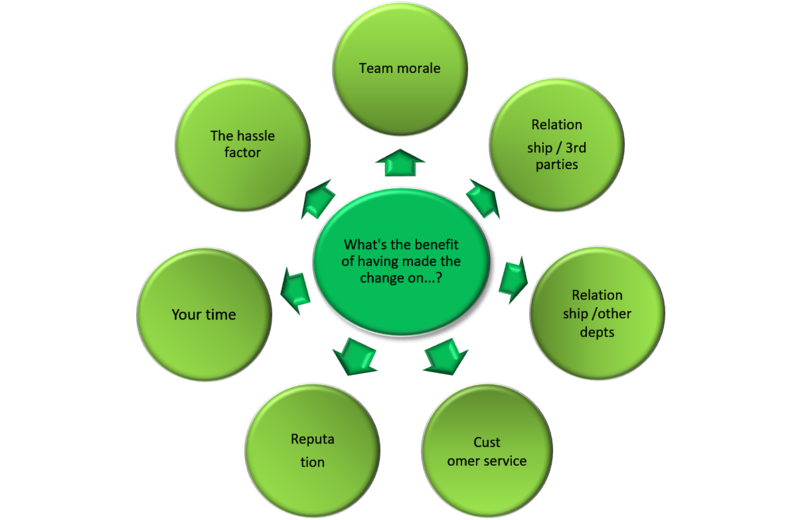 When organisations plan strategic changes, they will spend months on a detailed cost-benefit analysis. 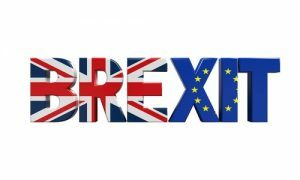 Consider the amount of individual time and media airtime currently being spent discussing the content of each of the three boxes related to Brexit. As long as you look at the broad picture for the whole of the UK, the job of quantifying the ‘weight’ of each of the three boxes will tell you whether leaving the EU will be a triumph or a disaster, or perhaps somewhere in between. Spending months (or even years) on those calculations is obviously a good idea when we are considering such profound political changes, but how can you do something more straightforward for the smaller decisions that your clients have to make for their team or department? The Impactogram gives you a simple mental checklist to assess possible areas that are affected by the problem. This gives you an indication of the true size of the problem. Some of these affected areas are less tangible ones that can otherwise be overlooked. 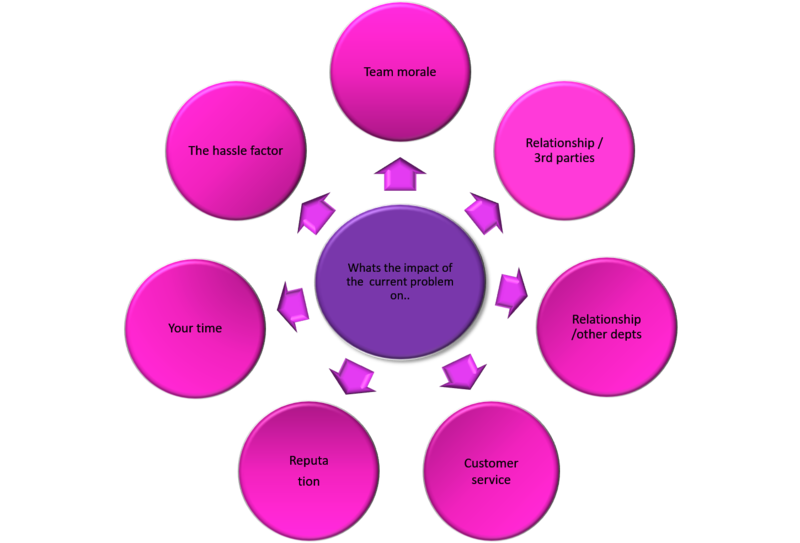 Ask yourself (or your client) “What is the impact of this problem situation on… team morale?” “What is the impact on your relationship with (e.g.) the council?” “What is the impact on your reputation as a team/ business?”…. you get the idea. You can select the questions that are most relevant to your context (and add other impact areas that are also relevant). As you assess the wider impact, the scale of the problem will be growing in your client’s mind and they will be developing a sense of whether living with the problem carries too high a price. It can also open the person’s eyes to impact areas they had not previously considered. To assess how much value the change could generate, you ask questions about the same areas, but this time your questions are phrased “If we solved this problem or made the right change … how much of your time would be freed up?” “What would be the benefit in terms of your reputation as a business?” etc. As an HR business partner, you are approached by Ramesh who is struggling with a demotivated team. There have been a number of new recruits that have left within the first year and there is a negative atmosphere in the team. The atmosphere is affected by the two team leaders who are very dominant characters: Tom and Sharon are longstanding members of the team who are very experienced and knowledgeable but who have a critical and cynical attitude. When the manager fully takes stock of how much of her time is devoted to propping up her team, and the poor reputation the team presently has within the business, she realises that the situation is not sustainable. So, when your clients weigh up the pros and cons of making a change, in your experience, do they assess the full impact of the problem and the potential value released if the problem were solved? ….and good luck with that Brexit calculation.